Though privately held, Huawei produces an annual report (audited by KPMG) that provides insights into its operations, strategy and performance. While Huawei’s revenue growth is well understood, its latest report highlights the importance of China to its bottom line and a continuing search for cross-business synergies. Once a year, a good share of the industry analyst community makes a trip to Shenzhen for Huawei’s Global Analyst Summit. At Current Analysis, we’re sending our entire service provider infrastructure team, along with analysts from our enterprise and consumer teams. Why dedicate so many resources? One answer is simple. Over a relatively short period of time, Huawei has transformed from a company seen as selling low-cost telecom gear to a reputable seller of telecom solutions with fast growing enterprise and consumer businesses. In the process, it’s grown its overall revenue base significantly to the point where (in total) it’s larger than almost all of its nearest competitors. Understanding the company, then, is critical to understanding the telecom market in general; its analyst summit is one of the best opportunities to discuss and learn of its plans, strategies and messaging for the year to come. At the same time, the company provides an opportunity to do just that every year, long before throngs of analysts show up at its door. The company’s annual report (released this year at the end of March) may not get the press attention of publicly traded competitors, but it does provide critical insights into the company’s past and future. It’s no substitute for visiting Huawei in person, but a valuable component to building a complete picture of the vendor. So, what did Huawei’s 2014 annual report tell us? A Picture of Profitable Growth. With roughly $46.5 billion in 2014 sales, Huawei’s revenues grew by 20% in 2014. Putting that into context, it’s about twice the growth rate of its best performing telecom rival in 2014 (ZTE). An 11.9% operating margin is down from 2010’s 17.4%, but roughly in line with last year (12.2%), suggesting healthy, stable growth. China and TD-LTE Made Its Year. When competitors refer to Huawei as a Chinese firm, they often imply that it benefits from national bias. Last year’s results seem to confirm this, with Huawei noting that sales into China were up 31.5% and TDD network builds driving a 22% increase in carrier business sales. Removing growth in China from the bottom line would have cut Huawei’s corporate sales growth in more than half – dropping down to about 9.7%. Corporate Growth vs. Carrier Networking vs. China. Overall corporate growth figures don’t tell you much when comparing to networks-focused competitors. Here, Huawei claimed its carrier business group grew by 16.4% last year – against the backdrop of most telecom rivals remaining flat or shrinking slightly. Even compared to itself, this substantially outpaced the single-digit growth Huawei showed in 2012 (6.7%) and 2013 (4%). Was China responsible for some of this? Sure. But, consider these facts. Enterprise and consumer business grew in China even more than Huawei’s carrier business did. If growth in China impacted its carrier business on par with overall revenues (roughly half of growth), removing growth in China would still yield carrier business growth that outstripped most competitors. Finally, growth percentages aside, the sheer size of Huawei’s carrier business (vs. enterprise and consumer) means that overall topline growth was fueled by carrier revenues; in RMB terms, the carrier business unit grew by about 20% more than consumer and enterprise combined. Still Looking for Business Synergies. If there’s one place where a company gets to detail the breadth and depth of its businesses, it’s in their annual report. There’s a difference, however, between talking up the success of a business unit and speaking to synergies across business units. Huawei does a great job of the former, but not the latter. To be fair, it’s not alone in missing this opportunity. Regardless, if you were to ask how Huawei’s smartphone, carrier network and enterprise business units were linked, you wouldn’t find much of an answer in its latest messaging. That’s a missed opportunity, particularly as IT and telco networks converge, 4.5/5G IPR plays a role in both device and network development, and Huawei stands out as one of a only a few vendors maintaining a sprawling set of product lines. 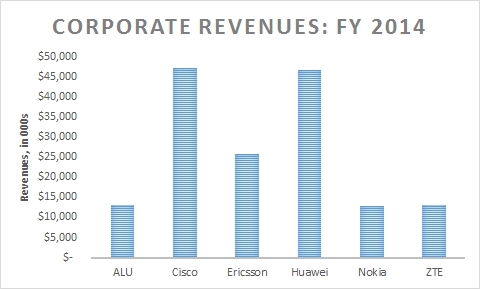 Where Huawei Is Investing Its Money. Leveraging an annual report to tout technical accomplishments is par for the course with telecom vendors. Huawei calling out 5G R&D, SDN/NFV work, 400G router deployments and professional services momentum was all expected; it matches industry themes while pointing to the breadth of its technical development. More interesting, however, are Huawei’s discussions around cybersecurity, corporate governance and employee development. In the West, at least, Huawei isn’t always associated with cybersecurity – perhaps making efforts there important for Huawei’s image. Corporate development, in turn, is another thing not usually highlighted in Huawei press releases or announcements, but critical to its effort to transform into a stable, mature vendor. Next postLeveraging PNFs into VNFs: Get Your NFV Application Messaging Out Soon!